Banbridge Town’s new goalkeeper wants to use his spell at the club to exorcise his demons. Former Cayman Islands international Tuda Murphy made his debut during the 3-1 win over Moneyslane on Saturday and afterwards, told the ‘LEADER’ just how delighted he was to be back on the pitch. It is those much-documented struggles with the boot that Murphy is keen to put behind him and he is confident that he can lock them away into the past. “You can practice all you want but until you get into a game situation, you don’t know. I think it’s my technique that has let me down so now I’m just focusing on relaxing and trying to get the ball up in the air. The 34-year-old was keen to heap praise onto his new team-mates after playing his opening match at Crystal Park. “Ryan (Watson)’s a great guy and the group we have at the club are fantastic,” he said. 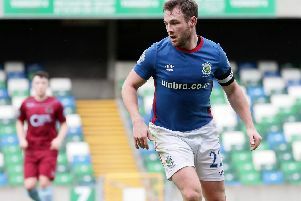 Murphy was brought straight into Town’s line-up but was keen to stress league games are a different matter. Murphy’s ambitions, however, are still high and he is even targetting a return up the league tables. “I still want to play at the highest level and I’d love to finish my career in the Premiership,” he said. “Even if that doesn’t happen though, I might love it at Banbridge and be happy to finish it off here. “It feels so good to be back. Nadine had been saying that you’re a long time retired and encouraging me to go and play again so that’s why I went to traing with Glenavon during pre-season.